Big Blue plans to ramp R&D spending on integrated circuit technology research. 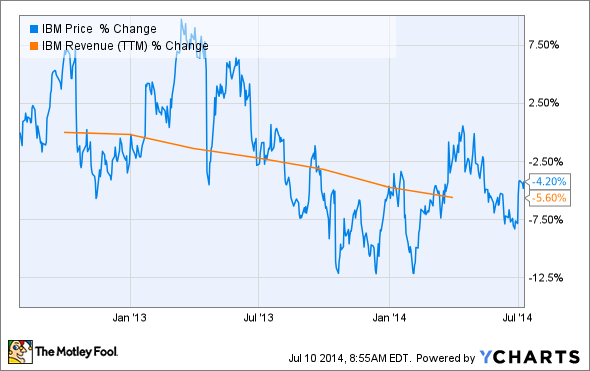 IBM (NYSE:IBM) has been in a swoon for couple of years now. Lack of revenue growth has unnerved many investors and led to a decline in the stock price. A series of business and financial moves such as share buybacks and commercialization of its artificial intelligence computer Watson has so far failed to stem the tide. Now Big Blue is betting big on going small to try to liven things up. The Armonk, New York-based company is planning to spend up to $3 billion over the next five years on research into, among other things, reducing node sizes of integrated circuits, the building blocks for almost all electronic products today. Assuming an average expenditure of $600 million a year this represents about 10% of the company's R&D spending. No small change. Will this be the thing that finally turns it around for the giant technology firm? And what do other big players in the chip business like Intel (NASDAQ:INTC) plan to do? Since the 1970s, when the microprocessor was invented by Intel, the number of transistors inside a chip has doubled about every two years as the result of miniaturization. Intel co-founder Gordon Moore predicted this way back in the 1960s. Devices packed with more transistors can perform more functions at a faster pace and consume less power. For example, today's smartphones contain over 2,000 times the memory available in the first PCs, and have a much smaller footprint. And of course at a much lower price. In order for Moore's Law to continue to hold up, technology will need to be improved. Enter IBM. Research will be conducted at several different locations worldwide and the company will enter into partnerships in the academic and business worlds to try to make this happen. In addition to improving conventional silicon technology, IBM will also investigate whether other materials such as graphene, a carbon-based compound, and nanotechnology can be used in new chips. If IBM's research leads to boosting revenue streams from licensing agreements it is possible the company and its investors will benefit. Don't bet against Big Blue yet, but it might take a while for a payoff. Intel knows about miniaturization, probably better than almost any other tech company today. Advances that the firm made led directly to the PC and Internet revolutions that have transformed society today. A great many computers shipped featured the phrase "Intel Inside" on the box or on the device itself. Along with the server business Intel relies heavily on the PC for a sizable chunk of its success today. To counteract an ongoing decline in shipments of desktops and portables, however, the company will probably have to expand further into mobile on a bigger scale. It produces processors for smartphones and its own lineup of tablets but those products do not command much of the market. Intel's own research into going smaller, toward the same 7 nanometer node size that IBM is striving for, could be another key to future success and to return value to investors. But will Intel spend the same amount as IBM? It could probably do it as its R&D budget is about $10 billion a year, the highest in the semiconductor industry. IBM is gearing up for research into making integrated circuit node sizes smaller. If all goes well this could eventually lead to a boost in revenue, something lacking at Big Blue recently. Time will tell. Intel, the industry leader in going small for so many years, is capable of matching Big Blue in chip research but should also think about getting into mobile on a bigger scale too if it wants to return more value to shareholders.